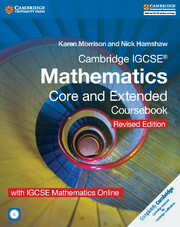 Revised edition of the IGCSE Mathematics Core and Extended Coursebook for the 0580 syllabus for examination from 2015. 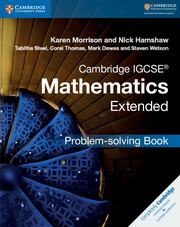 This Revised Edition of Cambridge IGCSE® Mathematics has been updated to reflect changes in the Cambridge IGCSE® Mathematics 0580 syllabus and ensure full syllabus coverage. With clearly marked core and extended material, the coursebook provides clear explanations and practice exercises to help students master mathematical skills.This highly illustrated Coursebook, written by experienced Cambridge IGCSE Mathematics teachers, ensures that students at all levels have access to the whole syllabus, enabling them to stretch themselves and find support as required. 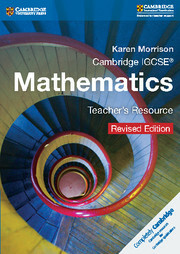 The Extended material is clearly marked, and there are useful tips in the margins for those students needing more support.Updated material includes: Further materials to explain and practice recurring decimals and fractions Additional exercises on exponential growth and decay, and the gradient of parallel and perpendicular linesThe accompanying CD-ROM includes calculator support, interactive revision questions and revision worksheets tailored for Core and Extended students (complete with answers). Worked-examples throughout demonstrate typical working and thought processes. Progressively challenging exercises complete with answers at the back of the book. Tips in the margins for additional support and clearly marked Extended material. Exam-style questions at the end of each chapter. A Glossary to explain new and complex words.